My redecorating project is complete! I ended up using the Benjamin Moore paint in Navajo White, Barely Beige, and Seedling for the kitchen; and the Home Depot paint in Leather Clutch for the upstairs and entryway trim. 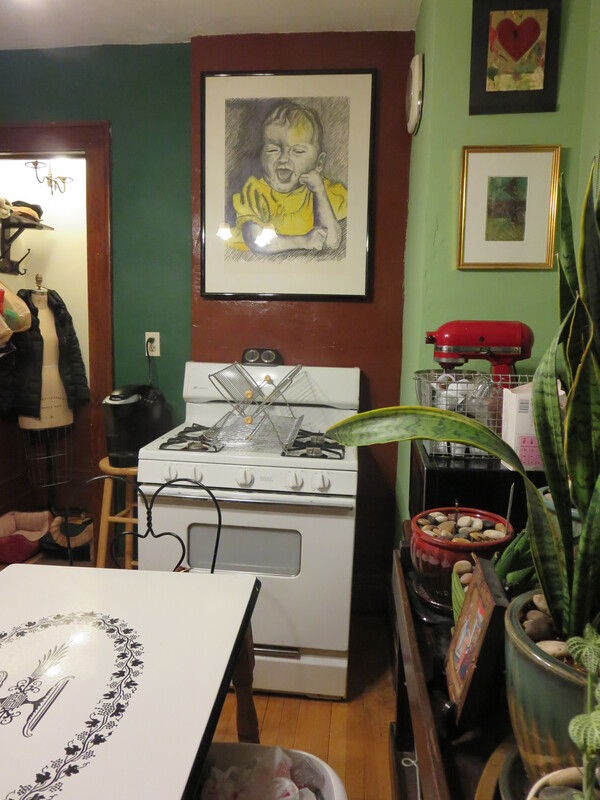 I love a green kitchen for some reason, but I’m all about neutral walls everywhere else. 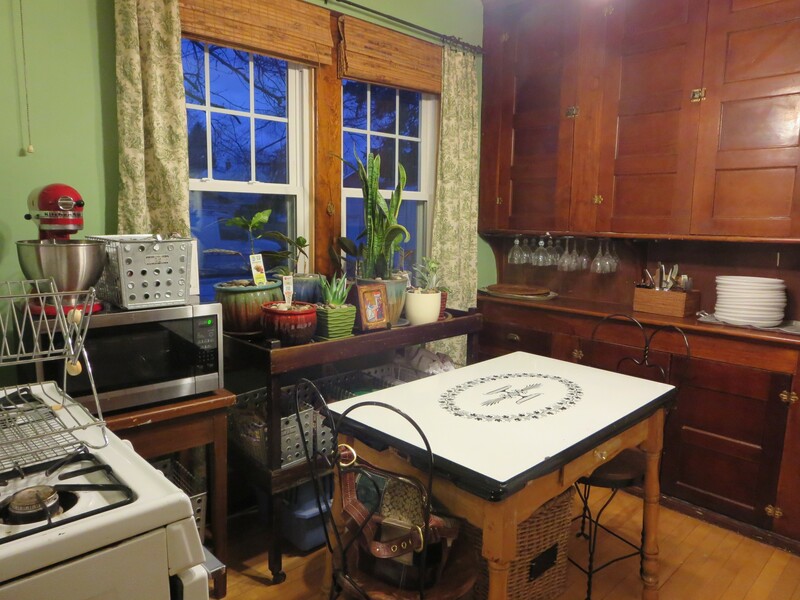 I love when the house is finally camera ready, but it is always a fleeting moment in time. There is always something that needs putting away or another dish to wash. It’s a never ending saga. Honestly, I cannot believe how much work I did. I was like some kind of crazy Tasmanian devil or whatever. There was a bit in the middle where it was so overwhelming that I had a mini meltdown but that’s how I seem to accomplish everything. Confidence then doubt and then push through it, and finally, completing the vision. Tomorrow it’s back to the real world and to more art stuff. Work. An art reception on Friday night. And on Saturday, I’m judging an art contest. Now it’s time for Orthodox Easter dinner at Mom & Dad’s. Your house is a work of art, Karen. Really. Beautifully done. 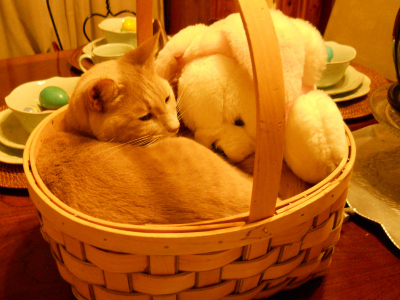 And I dig your kitty in a basket with a bunny. I hope you had a great Easter, my friend. Thanks, Mark. I painted every wall with a brush, not a roller, because of the unevenness of the plaster walls. Painstaking but worth it in the end. 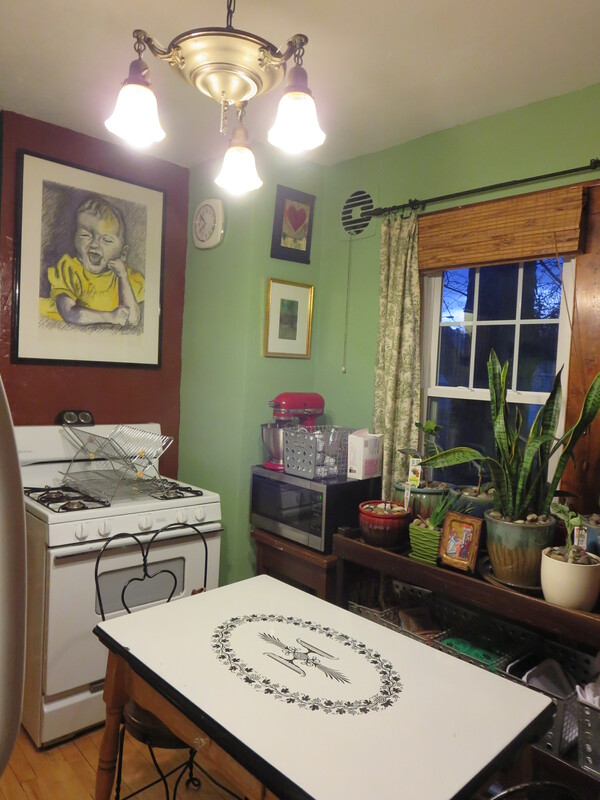 I still love-love-love those kitchen walls in Benjamin Moore Seedling! Pablo in a basket looks like a sweetheart but is currently not getting along with his brother Georges. Not fun! And a topic for another blog post.